A decadent time for the home, the Victorian era flaunted excess and wealth by bringing luxurious interiors to life with elaborate furniture and ornate decor. Named for Queen Victoria's reign, it was a period without design restraint, combining historic styles, luxurious textiles, lavish patterns, architectural elements, and bold colors. Brimming with plenty of design concepts, the era is rife with decorative inspiration for the contemporary home — as proven by these seven modern-day Victorian bedrooms that are full of enough opulent flair to bring your Wuthering Heights dreams to life. 1. Don’t forget about romance. 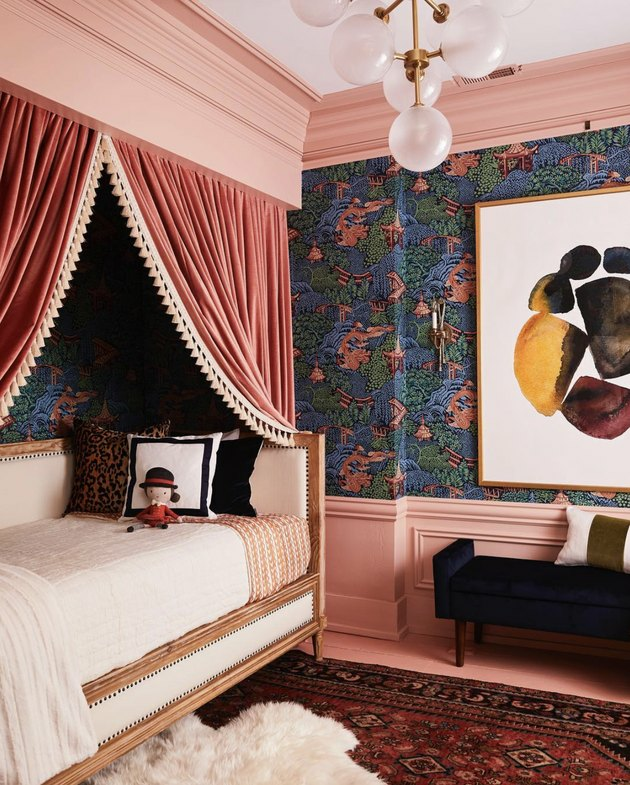 The mother-daughter interior design team behind McGrath II imbued the romance of the Victorian era into this sweet bedroom with floral fabrics, lavish window treatments, and precious touches like embroidery. 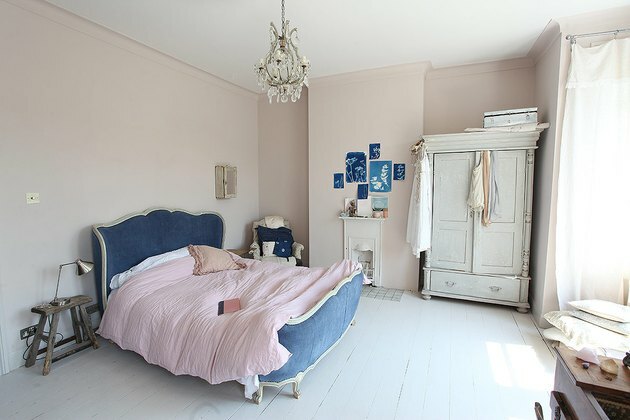 The minimal pink walls and crisp white linens give this bedchamber a fresh, modern look. 2. Let your furnishings shine. Furnishings take the limelight in this sparsely outfitted Victorian bedroom. With a neutral backdrop and minimal decor, a mix of period pieces — like the upholstered bed, wingback chair, crystal chandelier, and antique armoire — stand out. While the Victorian period combined an array of historic styles such as Gothic, Renaissance, and neoclassical, exotic influences from far-away lands like Asia, India, and the Middle East were also prevalent. A near picture-perfect example is this colorful bedroom in which Andy and Candis Meredith of HGTV's Old Home Love covered the walls in a vibrant Oriental toile to break up the candy-coated pink walls. Highlight the bed, the star of the show, with an elegant canopy as seen in this Victorian bedroom captured by photographer Chaunté Vaughn. In this modern bedroom fit for royalty, a simple white fabric bordered with black tassels adds a layer of sophistication. 5. Mix patterns and fabrics. While the Victorian era mixed fabulous, busy patterns and luxurious textiles — such as silk, velvet, brocade, tapestry, chintz, and damask — to create uber-textured rooms, you can do the same with a more modern approach. In her daughter's bedroom, artist Angela Chrusciaki Blehm created a contemporary look by mixing pale and bright, retro-inspired textiles, paired with motifs like polka dots and abstract paintbrush strokes. 6. Play up architectural details. 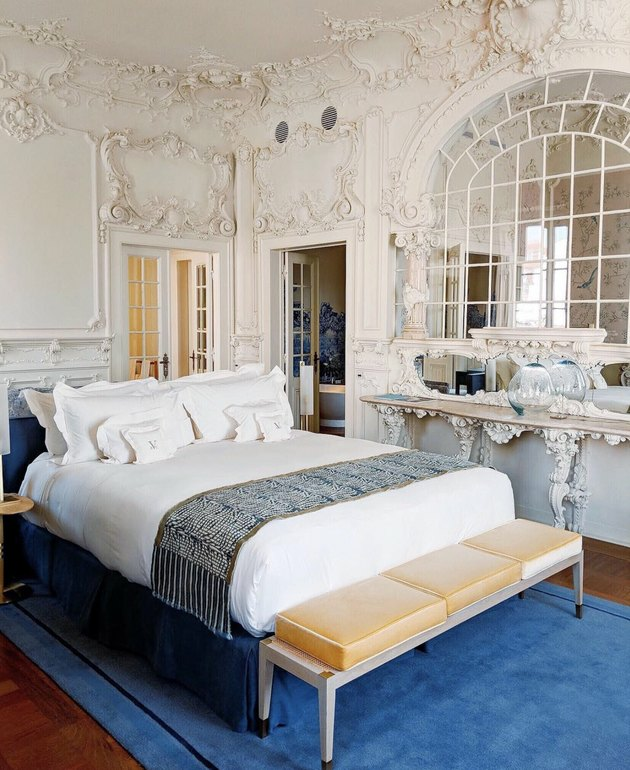 As captured by photographer Ana Linares, the decor in the Queen Suite of Lisbon, Portugal's luxurious Verride Palácio Santa Catarina screams rococo with its over-the-top, ornate scrollwork and sculpted molding. Let elaborate architectural details shine by juxtaposing them with a subdued color palette and sleek furnishings. Victorian interiors employed both dark, rich colors along with dusty, muted hues similar to the palette of this beautiful hotel room that photographer Signe Bay was lucky enough to stay in. 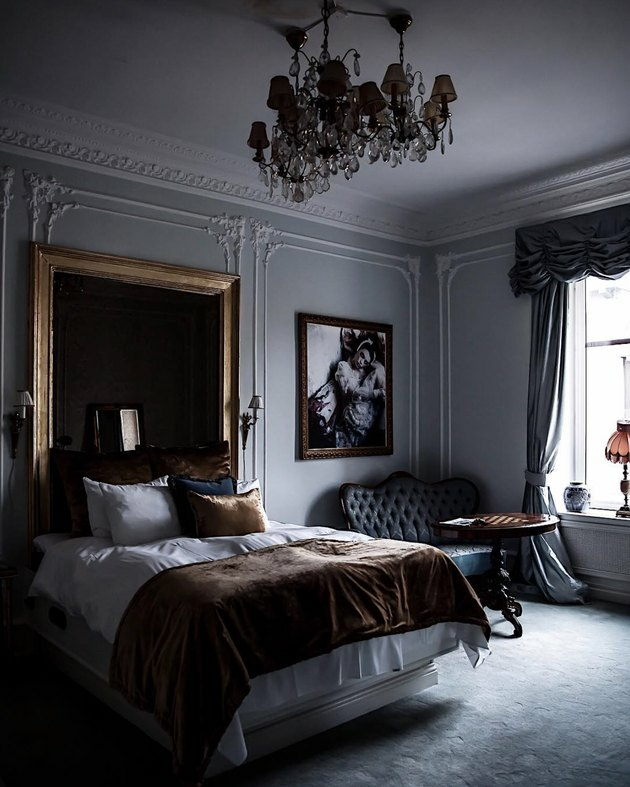 Gothenburg, Sweden's luxurious Hotel Pigalle gussied up its bedchambers in pale and dark blues that were paired with sumptuous textiles and carved upholstered furnishings. Swoon!